THIS was infinitely better than Season 2, though I am sorry to have discovered it just now, so long after its release. I would have liked to see it go on... without that annoying Chizuriu. Which is why this was so much better, plus it gave much insight to the first 2 seasons. Also, you can watch this one out of sequence. I appreciated the effort put into historical, political and character accuracy (except for some of the dialog of course, ha). However, much was left out - I am sure it is due to social constraints as well. Season 1 (which was also repackaged as a movie - very confusing due to the Japanese titles and very little reliable, constructive, accurate and concise information on anime on the internet - an easily searchable, google-like search engine Anime Database anyone? With full information about all anime? Lovely. ), was excellent and season 2 was very good, in that it advanced the historical story and the story of the characters, until it lost its footing inserting a love interest that never belonged in the story at all....and to a smaller degree, relying too heavily on the "zombie craze". See the additional review below. On, no, no, no. They should never have written this as "he fell in love with her". All through the series, he had indicated that she was like a sister to him, no matter of her taken care of them and him. If there had to be a love interest it should always have been Heiskue. She was always concerned for and cared about him and made it very obvious, since the first season. Plus, this very late love interest did not really come about until perhaps he 7th or 8th episode. It certainly made no sense and was blatantly out of place in the story arc. It was a mar on the entire story for me since it was right at the very end and out of nowhere. I'm sure they will say that they set this up for quite some time, but I am sure that I'm not the only that felt this as totally wrong. I already know that I am not the only ne doesn't like the Chizuriu character whatsoever, so... ; ) Oh, and what about Season 2b? What was thet even about? The filler episodes, I mean. They were simply "much to do" about how each and every man in the ranks had a "thing" for this girl. Please! The rest of the story is good with the lesser exception of relying too heavily on the "zombie craze". This was one of the first anime I had ever watched. All the characters have solid backgrounds and I would have loved if the animators would have created another season. It leaves people wanting for me episodes and it really sticks with you once you watch it. Absolutely brilliant prequel to the previous two seasons. The pacing and story is well executed, and you'll be wishing for more episodes by the end. The flashbacks and character development just adds to these already wonderful characters. Must watch for Hakuoki fans. A MUCH WATCH FOR THE SAMURAI GENRE! All the seasons were GREAT! Love the way they keep actual history intertwined within the series and also putting some action and fiction. Recommend watching this first than the other two seasons. A much watch for any samurai and historical fan of anime. If Only This Is How We Were Taught History! This is such a solid series and a great prequel to the main two seasons. I'm sort of sad that I had to watch this out of order because it provides a lot of background to the main characters in the following seasons. As always, the music is fantastic and the visuals are mind-blowing. The plot is very solid. Unfortunately, the main character sees only a little development late into the series (depending upon how you look at it, you might think there was none at all). Also, he had to grow on me. My favorite characters, Hijikata & Saito, shown once again. This leaves me wanting more, more, more, more, and more!!!!!!!!! I just watched the first and second seasons of Hakuōki before watching the prequel. My intent was to watch them in the order of their original release as follows: Hakuōki (1st Season is Available on Crunchyroll), Hakuōki Hekketsu-roku (sequel), and Hakuōki Reimeiroku (prequel). First of all, the plot is contiguous there are no holes so it was executed nicely unlike some other series. The main problem is something entirely separate. The prequel lacks something the other two had: a driving force. The first two seasons were driven by Japanese history. It had a continuous plot that had a pre-determined ending, and it was a matter of filling in the the character personality of these historical figures amidst their historical impact. Because the prequel lacked a definitively detailed history to drive it like the previous seasons it felt like the screen writers weren't sure what to make the driving force for the series. They pulled the base historical facts they had on the Shinsengumi during it's time with Serizawa in command, and relayed that information and how he met his demise. Sadly there is not enough historical data to really make up a 12 episode series, particularly since the story only takes place over the course of less than a year in comparison to the 5+ years that the first two seasons took place over. They obviously wanted to introduce the back story for some of the main characters, and explain why the Shinsengumi developed into what it was when we first met them in the first season. It did this, but there was no "heart" to this prequel. The personalities of the main original characters were already very well flushed out from the previous two seasons, so there wasn't much left to do. The viewer just gets to see some very minor additional information on how they became who we meet them as. If you enjoyed the epic battles of the first two seasons then you'll be left wanting as well. There are only a few because the Shinsengumi are effectively historically handicapped. They just aren't in the midst of the war yet. Additionally, the "outside view" character Ryounouske lacked in depth even more so that his predecessor Chizuru and actually detracted from the series in comparison. Whereas, Chizuru brought out the protective instinct and kind nature of the Shinsengumi, her male stand in brought literally nothing to the table. And so he was quite easily discarded at the end of the series, obviously he had to leave because he was not there when Chizuru arrives. I came away from the prequel feeling really nothing from it except a, "well I know a little extra character back story now?" The plot just didn't move me, especially after having just watched the first two seasons right before it. 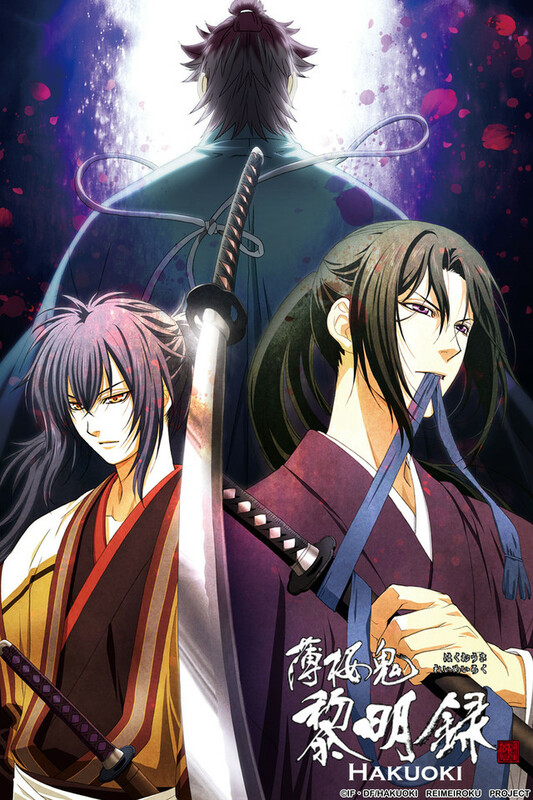 My suggestion is for people to watch this series starting with the prequel ( Hakuōki Reimeiroku) first. Otherwise you'll be left wanting, and not wanting in the, "I want more" way the second season (Hakuōki Hekketsu-roku) leaves you. I can conclude that watching the series in chronological order is best. There are things that didn't make sense in the first episode of the original season and other episodes that now make sense to me because of the prequel. Ex. Shinsengumi vs. Shinsengumi in context/kanji. If you watch the prequel and the first episode you'll understand the confusion and fuss of a particular scene. The prequel emphasizes certain things that weren't entirely covered in the first season. So if you want more insight chronological is the best way to go. Actually Never Mind about that, ^^^ I didn't know about the 2 seasons of Hakuoki. This is a great show! I wish they had more episodes with just the shinsengumi guys before hakuouki shinsengumi kitan started. I hope they can make the games in English sub so I can actually play them!